During the 2018 NAMM convention, ACT OF DEFIANCE guitarist Chris Broderick (ex-MEGADETH, ex-NEVERMORE) and vocalist Henry Derek Bonner (ex-SCAR THE MARTYR) spoke with RadioactiveMike Z about the differences between the group’s new album, “Old Scars, New Wounds”, and the band’s 2015 debut, “Birth And The Burial”. “‘Birth And The Burial’ was much more Shawn [Drover, drums, also ex-MEGADETH] and I going, ‘We want to get this out as quickly as possible,'” Broderick recalled. “At the time that we were writing the material, we were also forming the band and coming up with the ideas of the band name, the logo, shopping for the label, all that crazy stuff at the same time, so we definitely felt a huge sense of urgency with that one. This one, obviously, we all came into it together. The process started out the same, with us each kind of presenting demos, but then, once we collectively had all the demos, then we got together and started looking at what was best for the chorus or the arrangement of the song or tempos, things like that. We spent a lot of time crafting the song in general this time, and it was much more of a group effort. 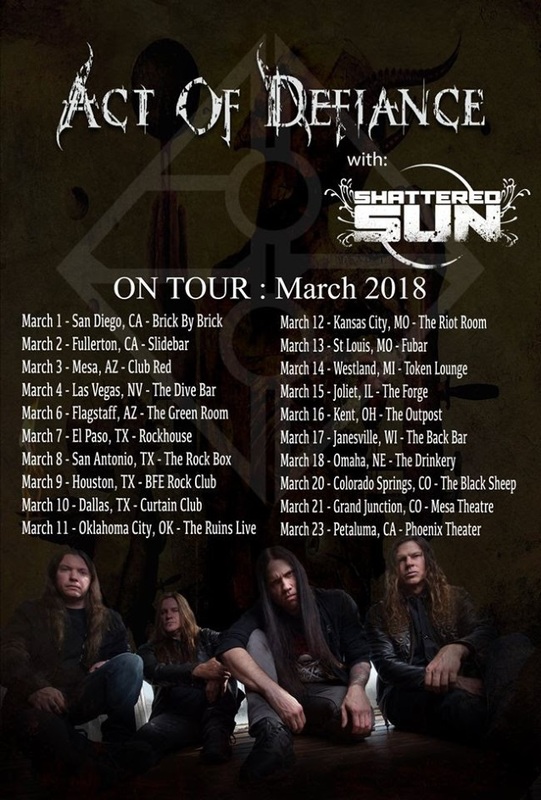 ACT OF DEFIANCE will embark on a headlining tour in March with support from SHATTERED SUN. “Old Scars, New Wounds” was released last September via Metal Blade Records. The disc was mixed by Dave Otero, who has previously worked with CEPHALIC CARNAGE and CATTLE DECAPITATION, among others. The cover artwork was created by Travis Smith (KING DIAMOND, OPETH, AVENGED SEVENFOLD, STRAPPING YOUNG LAD).